Cree culture, language and "...the man who made birchbark talk." ...and their Cree (aboriginal) roots. Language: Cree is an Algonquian language spoken by more than 45,000 people across southern Canada and into Montana. There are four major dialects of Cree: Central and Swampy Cree, Western and Plains Cree, Coastal (or James Bay) Cree, and Inland (or Eastern Inland) Cree. Some linguists consider these distinct languages, but they are largely mutually intelligible. Montagnais, Naskapi, and/or Attikamekw are sometimes considered dialects of Cree, but have diverged more than other Cree dialects and are usually considered distinct languages. Cree is written in a unique syllabary which uses shapes to represent consonants and rotates them in the Four Directions to represent vowels. People: The Cree are Canada's largest native group, with 200,000 registered members and dozens of self-governed nations. "Cree" is a French word of disputed origin (in French, créé means "created"); when speaking their own language the Cree refer to themselves as Ayisiniwok, meaning "true men", or Eenou, Iynu, or Eeyou, meaning simply "the people" (this word has the same Central Algonquian root as the Montagnais word Innu). There are also more than 100,000 people known as Metis, of mixed-blood Cree, French, and other Indian ancestry. Though many Cree regard the Metis as Cree brethren--and, indeed, though many registered Cree are also mixed-blood--the Metis have their own creole tongue (Michif) and a unique culture. The Montagnais and Naskapi Innu are related to the Cree but consider themselves distinct. History: Cree history is very hard to synopsize because the Cree span such a broad territory, from the Rocky Mountains all the way to the Atlantic Ocean. Though their common culture and language bind them together as a people, the Woodland Cree and James Bay Cree do not necessarily have any more shared history than the white people in Alberta and Quebec do. With that caveat, though, the Cree as a whole have weathered European colonization better than perhaps any other native people of North America. Their sheer numbers and broad range helped keep them from being too decimated by European diseases to maintain stability, as happened to many smaller nations, and their particular cultural affinity for intertribal marriage (remarked upon in the oral histories of their neighbors) meshed well with the intent of the French, the primary Europeans to have dealings with them. Where the English tended to try to move Indian groups further away from their civilization, the French tried to engulf them. The Cree, who had held a similar attitude towards colonization (long before the French got there), "engulfed" back. The result was the Metis, a race of primarily French-Cree mixed-bloods, and distinct French and Cree populations who generally got along pretty well. Since Canadian nationhood, the Cree have faced the same problems of self-determination and land control that every aboriginal group does, but they remain better-equipped to face them than most, and the Cree language is one of the few North American indigenous languages that is assured of surviving into the next century. RIO DE JANEIRO, Brazil (AP) — The discovery in southeastern Brazil of an 11,500-year-old skull - has been established as the oldest in the new world. It may help to rewrite the theory of how the Americas were settled. A scientist studying "Luzia", as the fossil is called, says his findings don't fit the old idea that the first Americans crossed the Bering land bridge in a single massive migration between 11,000 and 10,000 years ago. Researchers on separate projects have been coming to similar conclusions. Luzia apparently came from the South Pacific. That, according to University of Sao Paulo anthropologist Walter Neves, means that Asians were NOT the only early settlers of the Americas, nor the first. "This is the first known American,'' said Neves in an interview. "We were always told that the Americas were settled by Mongoloid peoples, but this shows that a very different population came before them.'' Researchers found the skull and other bones near Belo Horizonte, about 200 miles north of Rio de Janeiro and determined that it probably belonged to a woman age 20 to 25. Scientists dubbed her "Luzia", the Portuguese name for Lucy, the oldest known human unearthed in Africa in the 1970s. The skull and artifacts from what seemed to be a campsite were brought to the National Museum in Rio. Consistent results in carbon-dating tests carried out in France and Brazil have Neves convinced that the chance of error in dating the skull is "very slim.'' In 1995, Neves began tests to compare Luzia with modern humans. He found that Luzia's skull and teeth had characteristics similar to people of the South Pacific. That strengthened his belief that Pacific tribes reached the Americas before the Mongoloids, who arrived 8,000 to 9,000 years ago. A growing body of evidence supports the idea that migration occurred earlier and more often than scientists had thought. Neves believes there were four distinct waves of migration, though he won't hazard a guess at when the first settlers arrived. Tom Dillehay, a University of Kentucky researcher who excavated at the Monte Verde archaeological site in southern Chile, dated to 12,500 years ago, has said there is evidence that people may have lived in Chile as early as 33,000 years ago. Neves' theories jive with the findings of U.S. anthropologists Joseph Powell and Erik Ozolins of the University of New Mexico, who tested about three dozen samples from North and South America. Since 1992, Powell has studied skulls and teeth of human fossils found in North America. He agrees that the first settlers probably were not from north-central Asia. "There has been mounting evidence since the late 1980s that non-Mongoloid people were among the first Americans,'' Powell said in an interview. Neves and Powell presented their findings at the 1998 annual meeting of the Association of American Physical Anthropologists. Among them: The first South Americans resemble South Pacific and African populations, while the first North Americans seem to be a mixture of South Pacific and European peoples. Syllabics were first invented in the late 1830's by James Evans for Algonquian languages and, as other communities and linguistic groups adopted the script, the main structural principles were adopted as well. Some variations occur. 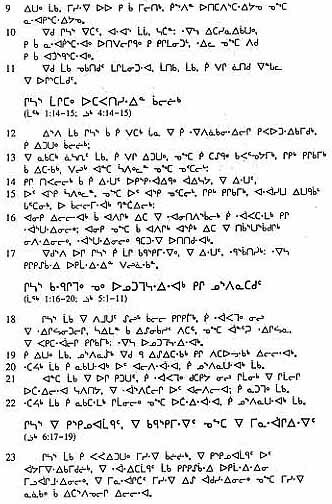 James Evans, a Wesleyan missionary working at Norway House in Hudson's Bay, invented a syllabary for the Ojibwe language in about 1840. He had tried to produce a Latin-based orthography for Ojibwe, but eventually gave up and came up with a syllabary, based partly on Pitman shorthand. Evans' syllabary for Ojibwe consisted of just nine symbols, each of which could be written in four different orientations to indicate different vowels. This was sufficient to write Ojibwe, but Evans' superiors were not keen on his invention and would not allow him to use it. About 20 years later, Evans learnt to speak Cree and set about the task of devising a way of writing that language. After encountering difficulties with using the Latin alphabet, he dug out his Ojibwe syllabary and adapted it to the Cree language. 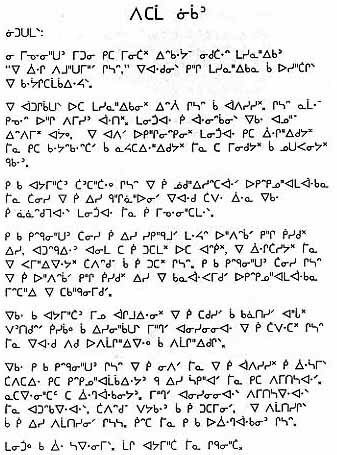 Thanks to its simplicity and the ease with which it could be learnt, the Cree syllabary was hugely successful with the Cree people. Within and short space of time, virtually the whole community were literate in the syllabary and James Evans became known as "the man who made birchbark talk." "...Jesus was bodily resurrected from the grave and ascended into heaven from which He will return to earth." Human-Languages WIKI on the topic of human-language resources. The Native Book Centre. An online native books store. Lone Wolf Multimedia Inc. a multimedia company that publishes for educational institutions as well as multimedia (e.g. talking books).